Layering is the key to smart, savvy style. 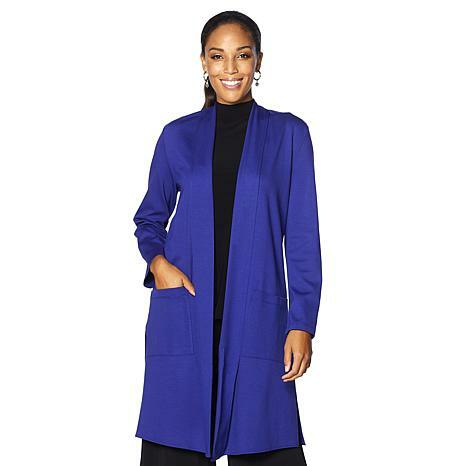 This long, ponte knit duster hides body hang-ups while adding a warm, fashionable topper to jeans, dresses and slacks. Mix and match with other Slinky favorites to create an assortment of incredible styles for any occasion. I really like this products. Love the colors, length and material. Beautiful colors. I am so glad I found this duster. I have been looking for this item for a long time in eggplant. I am especially pleased I found it in Slinky Brand, a brand that I have purchased for many years. True to size. It is not like other dusters. You can wear as casual but looks better to wear as formal. Also the material is heavier but great. Quality Ponte material, nice lines and fits perfectly. A white faux shearling collar snaps at the neck, securing the otherwise open design. 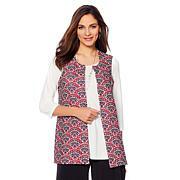 The color repeats at the pocket and interior placket for a pop of contrast. Wear it buttoned or open for a cozy outer layer.